Rob Talbert has worked in a jail, an ice cream store, and on a cruise ship. Before moving back home to Texas, he received his MFA from Virginia Tech. His first book of poems, Jagged Tune, is forthcoming from the very awesome Mad Hat Press. 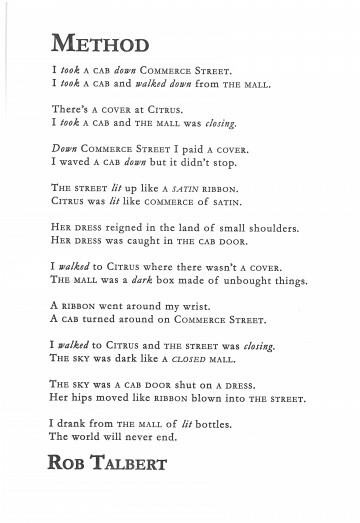 This poem starts clearly enough with “I took a cab down Commerce Street” but what sense can be made of a line like “I drank from the mall of lit bottles”? And was there or was there not a cover at Citrus? Unlike everyday language, poetry isn’t required to convey clear, concise information. Meaning can derive from sound and emotion, too, which is this poem’s strength. Talbert’s method is kaleidoscopic: the same words and phrases tumble like colored beads into startling new images like “The sky was a cab door shut on a dress.” And they keep tumbling, so the mall can be both closing and closed; ribbon can mean the street or a girl’s hips; the speaker can both ride and walk along Commerce Street. It’s all so confusing and anxious, the rhythm of each line pounding like a drum. And even though the poem itself must end, it gives the impression that it never will, even before the last line tells us so. The jumble of images and phrases in this poem chafes against the regularity of its couplets. Using different styles of the same typeface accentuates that repetition without destroying the continuity provided by regular structure. To be successful, though, that single typeface had to be versatile, which is to say legible in many styles: Garamond.